Slack could be the answer to the splintered state of most teams' communications—my team's, and probably yours, too. It’s splintered because email is clunky for conversations and gets clogged with attached files. Chat is faster, but its file handling is rarely up to a team's needs, and it can be difficult to search (not that email is much easier). Currently in a limited preview release, Slack, from developer Tiny Speck, works the way many team-messaging software apps do, but with a few big improvements: It's cross-platform. It's searchable and very customizable. And you can attach files for sharing, or move files seamlessly between Slack and a cloud service. Slack makes it easier to work without feeling like work itself. By midday, my desktop is a jumble of different windows. In each of my two browsers, proprietary tools brush against story research. The HipChat messaging service is fast, but it crashes, and it’s not exactly a looker. And email...ugh. Email. A fresh Slack instance (installation) comes with most of what you need--and it's pretty easy to understand--but you can add integrations later. Slack is much easier. Each team installation of Slack is called an “instance,” and setup takes just a few minutes. A cute onscreen character called Slackbot steps you through the basics of inviting coworkers, sending and reading messages, and setting up a profile. It also sticks around on your team to help in other situations. 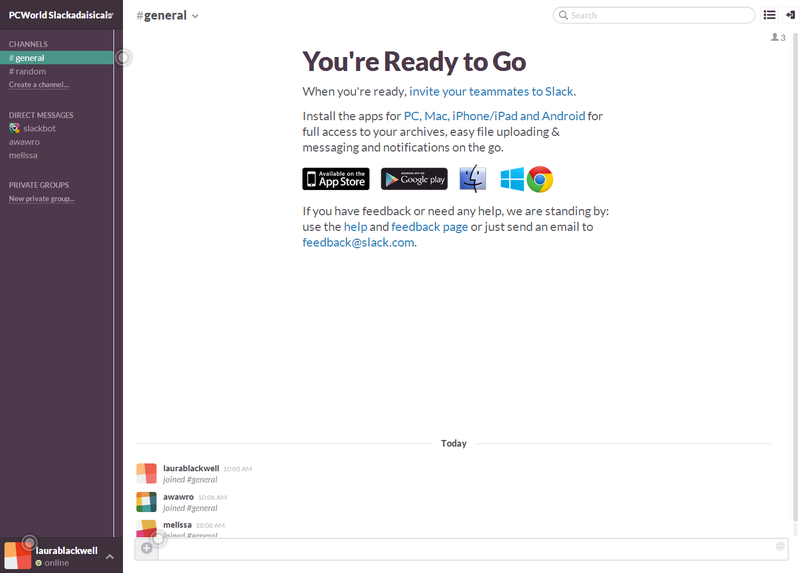 On the PC and Mac, Slack opens in a roomy, good-looking window. The font is legible, and the colors are soothing without being bland. You can use the airy Clean view or the more efficient Compact view. The flexpane (handy for conducting file searches or viewing your team roster while in a convo) toggles open at your command. It’s not resizable, so I usually leave it closed. 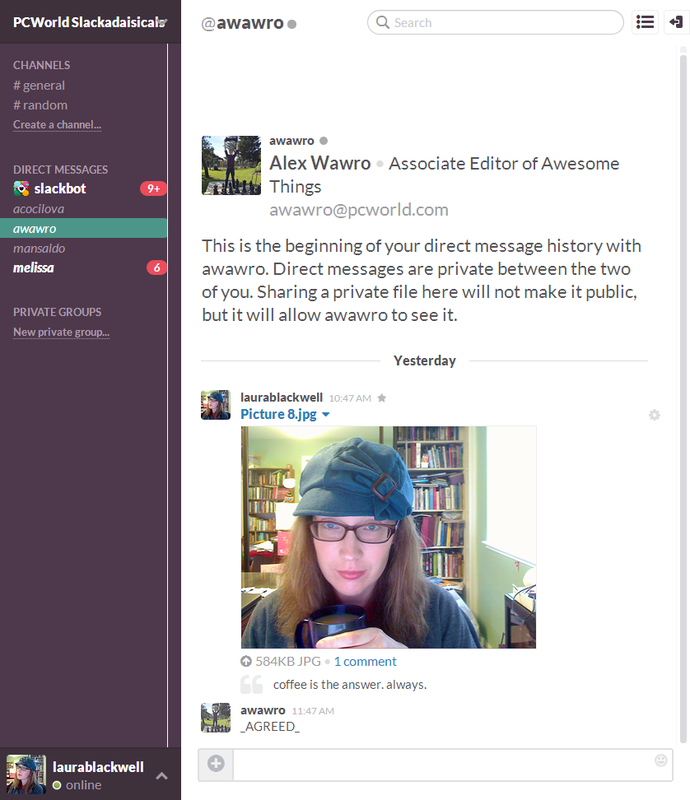 Right away, you can upload files by clicking the + button to the left of the text bar at the bottom of Slack's window. If you like emoji, you can use the smiley icon in the right of the typing field to add them in either Apple or Google Hangouts style. If you don’t like emoji, you can ban their display from your Slack window. The Android and iOS clients look similar, but they're adjusted to be intuitive to those devices and make sense on a phone’s narrow touchscreen. 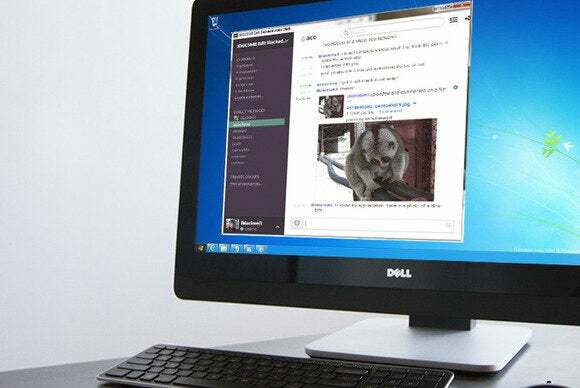 They're snappy and responsive, making it easy to have a conversation with people on different platforms. Coworkers ping me frantically on HipChat, asking if I saw their email. Of course I didn’t: It’s lost somewhere among company announcements, press releases for religious-historical novels, and all the back-and-forth with others on my team. Then there’s the slow, and often fruitless, process of searching Outlook for messages and files. When you upload an image into a private conversation, only the person at the other end can see the image and turn it up in searches. Slack's search and file handling are among its finest features. For instance, it’s easy to attach a file to a message and maintain control of its accessibility. If that message is to Slackbot, the file remains private. If the message goes to a coworker, only you two can see it. If you send it to a channel, anyone invited to the channel can see it. I like shooting off quick messages in Slack, but its spellcheck function makes it appropriate for paragraphs and longer conversations as well. A coworker filed stories to me in Slack, and we enjoyed the ease of uploading, locating, and discussing the docs and screenshots in one place. You can delete Slack messages manually, but Slack won't ever delete them for you. Apart from messages, however, you can delete files or move them to an integrated service, so don’t worry about clogging Slack with outdated files. Mousing over the "expand" icon to the right of this PNG previewed it without making me open it. Slack integrates with a number of popular services—over two dozen at this point, with more in the works—such as Dropbox, Google Drive, and Twitter. Many of them, such as Bitbucket and GitHub, appeal particularly to development teams. You can also build simple custom commands with Slash Commands integration. Slack also makes asking for help a seamless part of the experience. If you have a question about a feature, you don't have to leave a conversation. You can just ask Slackbot from a new line. For instance, to get help about search, you hit return and type /help search. 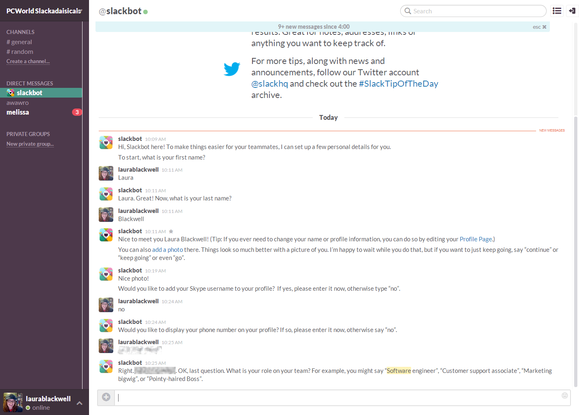 The “/help” command sends your message to Slackbot. 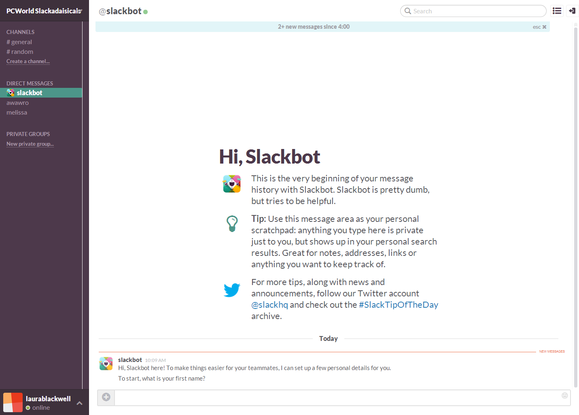 Slack itself is very forthcoming about Slackbot's limitations. Tiny Speck is the first to tell you that Slackbot is no rocket scientist. If Slackbot doesn’t have the answer, you can open a help page from within Slack or message “/feedback” from the text bar to reach Slack's support staff. In my experience, answers usually came back within minutes, and the responses were always friendly and on-point. As nice as the people are, I would prefer to have searchable help as well. Conversations with Slackbot are a good place to ask the bot to remind you of something, such as “/remind me in 2 days to turn in my expense report” or “/remind me in 30 minutes to eat something.” At default settings, the reminder pops up with a sound cue. If you miss the popup, you’ll still get a note in your conversation thread. It’s no surprise that Slack is so surprising. Tiny Speck developed Slack while running innovative, offbeat MMO Glitch, which closed a year ago this week. 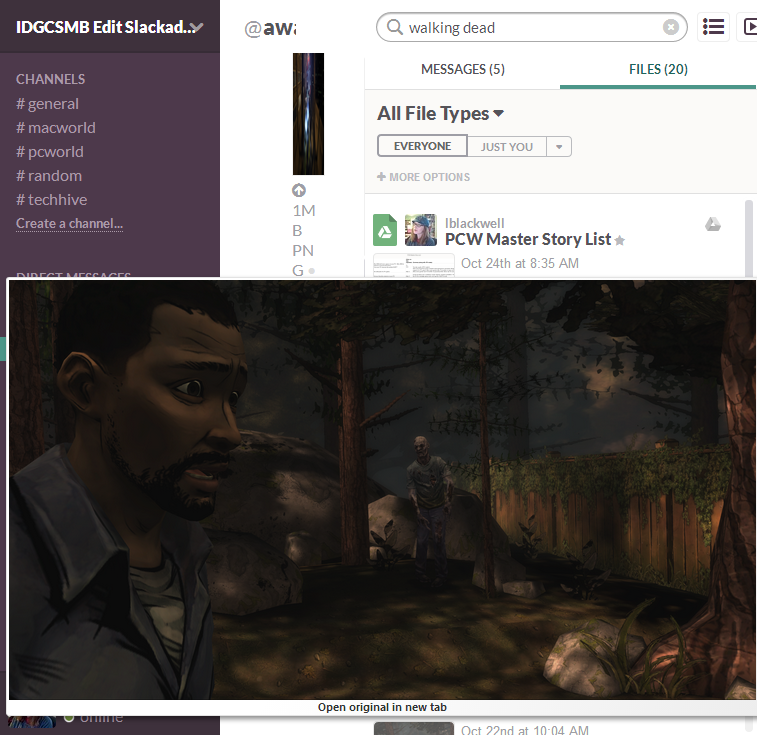 Glitch itself was the spiritual successor of Game Neverending, which spawned Flickr. Imagination and elegant simplicity are part of Slack’s pedigree. Slack is currently in a limited preview release. 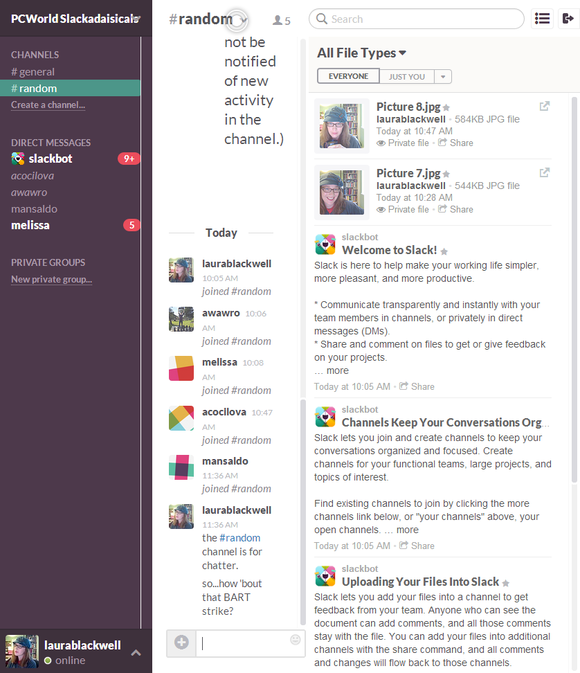 You can sign up for a free preview at the Slack website. Once your Slack instance is up and running, this screen tells you how to invite your team and start using it on different devices. 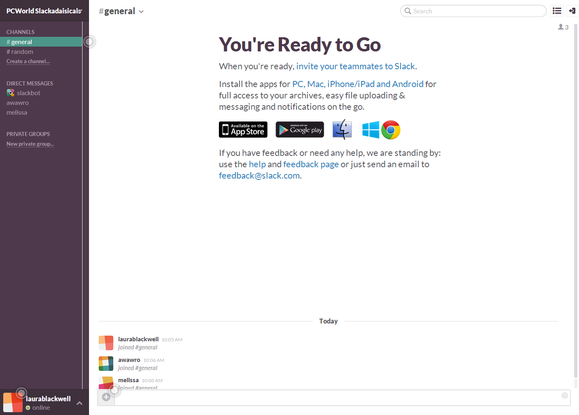 Early next year, Slack will launch into wider availability and with new pricing. The Lite subscription level (free) will keep a limited searchable archive, restrict integrations to a total of five, and cap total storage at 5GB. The Standard ($9 per user per month) will keep a full archive; remove restrictions on integrations; and allow 10GB per user, shared across the entire team. The Plus level ($19 per user per month) includes the benefits of the Standard level, with storage doubled to 20GB per user. An Enterprise level ($49–$99 per user per month) will appear in late 2014. All subscription levels include free native apps for Android, iOS, Mac, and PC. Team communication can be a tense, tangled snarl of inefficiency. The more I use Tiny Speck’s team communication tool, the more my shoulders relax. Maybe that’s why they call it Slack. Laura Blackwell's title is PCWorld Downloads Editor, but she can't keep her hands off cloud software, either.